Swing Brother Swing are one of the many incarnations of our own “Tamboo”, alias Sergio Tamburelli, coming via the Crazy Bus Band, the Tamboo Crazy Band, Dr. Delirio & Korg Orchestra, the Ticino Playboys, Skoppiabilly, the Rustik Boys, the Bonarda Wagon Boys, the Vampiri della Botte, Tamboo All Stars, Hot Six, Tamboo Combo, the Webs, Supersaxmachine, the Pavia Jazz Orchestra, the Tambognola Sconnection and TNT; mixing rock and swing, rythm’n’blues and country, and soul and pop with the blues and Italian music of the ‘50s in its continuous and uncontrollable desire for change. Swing Brother Swing is a return to this; in the sense that the group was formed in 2006 with a formation very similar to the current one, so that it might be considered a sort of reunion if it weren’t for the fact that at least three of the members (Tamboo, Bonelli and Perelli) have continued, in recent years, playing together in improvised trios, quartets and quintets. 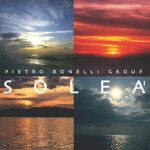 For some time, however, the group has been reformed, and with the addition of new musicians, now looks like this: Tamboo (vocals and washboard), Pietro Bonelli (guitar), Daniele Petrosillo (double bass), Fabio Villaggi (drums), Gianna Satta (trumpet, horn), Claudio Perelli (alto sax and clarinet). 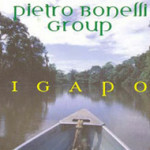 A concert held at the Milestone of Piacenza on the 15th of January this year was professionally recorded and transferred onto CD to create this album. 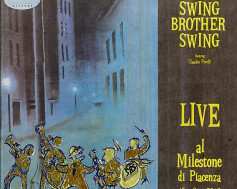 The genre, as the name of the group suggests, is swing (so dear to Tamburelli and to a talented jazz musician like Bonelli) and the songs range from Permettete Signorina to C’est si bon, Carina, Basin Street, Guarda che luna, 20km al giorno, Sing Sing Sing and Bourbon Street parade; in short, the classic repertoire of our Tamboo who is completely at home in this genre. The disc is well recorded and preserves all the magic of the live show in which the vocal exuberance of Tamburelli alternates with the solos of the professional musicians that know the genre well and know exactly what they are doing. The CD (Live at the Milestone) which in addition to providing good music which is well played and well sung, transports you to the inimitable atmosphere of the show that this group never fails to create. The band has been active since 2003, led by Sergio “Tamboo” Tamburelli. After a studio recorded CD and many live shows, the CD “Live al Milestone Jazz Club” was recorded on the 15th January 2012 in Piacenza. 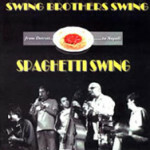 The music of New Orleans, swing and Italian jazz songs, plus a good dose of irony form the musical mix on the CD; real spaghetti jazz-swing from the ‘50s and ‘60s, with obvious references to Van Morrisson, Louis Armstrong, Nicola Arigliano and Fred Buscaglione.